Journeys is a very personal book for me. I have been living with the concepts in it for over 16 years now. It has literally taken more than a decade and a half of experience and study, as well as reading the book of Acts over 100 times, to feel right about publishing these thoughts. Hopefully all the seasoning and maturing of the concepts in this book are evident. I wanted to write a book that could benefit leaders that truly desire to follow Jesus and grow in life so that their end is stronger than their start. Because of this investment of my life, I feel very connected to this book. 1. It provides a clear Biblical framework for apostolic movements using the book of Acts. There is some debate whether or not organic church results in movements. Some say movements are not a biblical idea. This book will answer some of that question with clear demonstration from the New Testament. It will be hard to argue with the idea that the NT church spread virally and became a movement in a short time. This book not only demonstrates that but provides insightful applications for how and why. The strengths of this work, apart from the good overview of Paul’s life and ministry, are the post chapter sections dealing with lessons—first observations from Paul’s life and then often valuable personal lessons from the author’s life. Neil gives the best interpretation of Paul’s progress of ministry breakthrough insights that I have seen." 3. It provides potential solutions to questions in Acts that have not been satisfactorily answered in the past. This book will surprise you with observations that have not been given in other literature. Not all the solutions are dogmatic, but this book honestly deals with tough questions that typically are avoided. I have attempted to supply solutions that make some sense and add to the compelling narrative of Dr. Luke's book. 4. It shows that a mature leader can do less activity but accomplishes greater impact by investing in and empowering others and then releasing them into the work. You will be able to follow Paul's own learning curve and see how he discovered ways to reach people much more extensively and with more lasting results. His lessons become ours, as we follow Paul the way he follows Christ. 5. It makes Paul a real human leader that we can actually follow. Rather than a sinless-superhero that we cannot relate to, he becomes a person with the same kind of tests and temptations we all face and he can actually provide an example for us to follow. You do not have to be an apostle or a theologian to learn from Paul's example. Anyone who follows Christ will be able to learn from Paul's life played out so dramatically in the New Testament. Life i s not just one journey; it is several journeys, each culminating in valuable lessons that build toward our final breath and eternal destination. In Journeys to Significance, bestselling author and organic church leader Neil Cole takes us on a journey as we follow the life of the apostle Paul and learn valuable lessons about how God forms a leader over the course of his or her life. It's not about just reaching the end—it's about finishing well and keeping your eye on the ultimate goal, not on short-term wins or losses. 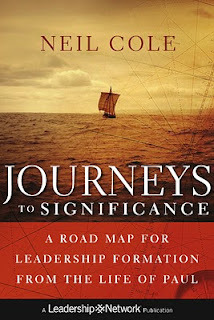 Journeys to Significance provides valuable insights to help any leader (or aspiring leader) to build upon each journey so that finishing strong is not only possible, but is a clear and practical focus in the here and now. The apostle Paul is one of the most pivotal world-changers in history. In Journeys to Significance, the story of Paul's life comes alive in an inspiring and helpful way and includes many real-life applications for the journeys we all must face. Cole adds fresh insights into Paul's missional strategies and the lessons he learned. Following Paul's lessons can increase a leader's impact and significance and contribute to a strong finish. As the apostle Paul demonstrated over the course of his life, if we are able to courageously follow God's lead no matter what it costs, we will discover the true meaning of leadership—and we will finish well. Life is not just one journey; it is several journeys, each culminating with valuable lessons that build toward our final breath and eternal destination. My newest book has just been released, it is called Journeys to Significance: Charting a Leadership Course from the life of Paul. If you have read any of my other books and think you know what I have to say, this book will be a surprise. It is written in a different manner (more narrative) and does not have the deconstructive elements often associated with some of my other books. It is also one of the shortest books I have written and easy to read in a relatively short time. It is not about church as much as about those who live a missional life, regardless of your church affiliation or preference. Following the life of Paul from start to finish this book shows how a person of influence is formed by God and shaped to have greater significance and ultimately to finish well. Any person who wants to make a difference in this world will find the book meaningful. Not only does Journeys provide a unique understanding of Paul's story in Acts, but it also provides new vocabulary for all of us about how God forms us for a life of influence. One can identify with the various stages of life development that the book describes and understand what lessons are most important at those phases of maturity. Wherever you are on the formation of your life, this book will explain some of the basic life lessons for that stage and also shed light on what is to come if you courageously follow the path through the current journey you find yourself in. It is not so much prescriptive, as it is descriptive of leadership formation in general and of Paul in specific. It is practical without putting all leaders in a single box. If you are a leader who desires to finish strong, you will find this book valuable. If you are interested in the book of Acts and the apostle Paul, this book will provide a fresh perspective and uncommon observations that will allow Paul to be more accessible as a flesh and blood example that you can follow. If you are a leader that is trying to figure out what in the heck God is doing in your current situation, this book may offer some helpful explanation. If you are a mentor to others and want to understand how leaders are formed and what is important at each stage of maturation, this book will grant you helpful insight. If you are interested in missional church movements this book will provide a biblical basis for how multiplication movements are catalyzed and spread. Based upon a life-time of solid research by Dr. J. Robert Clinton as well as very thorough research from the book of Acts and the Pauline Epistles, this book provides real practical lessons for leaders in any stage of development. It has taken me 16 years of research, experience and lots of mistakes to write this book, and because of that it is very dear to me. I think you will find it fresh and challenging.